An SD9 is a 6-axle road switcher diesel locomotive built by General Motors Electro-Motive Division between January 1954 and June 1959. An EMD 567C 16-cylinder engine generated 1,750 horsepower (1.30 MW). This model is, externally, similar to its predecessor, the SD7, but this model, internally, features the improved and much more maintainable 567C engine. The principal spotting feature are the classification lights on the ends of the locomotive, above the number board. The SD9's classification lights are on a small pod, canted outward. The last phase of construction had a carbody similar to the SD18 and SD24, and used two 48-inch (1,219 mm) cooling fans instead of four 36-inch (914 mm) cooling fans. Many have been rebuilt, and are still in service. Four hundred and seventy-one SD9s were built for American railroads and 44 for export. Chile Exploration 5 901–905 Track gauge? Dakota Southern Railway uses SD9 506 and SD9E 4427 in revenue freight service. 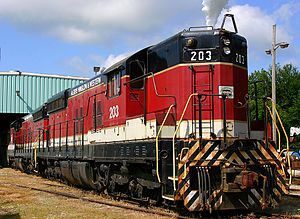 The Escanaba and Lake Superior Railroad uses #1223, formerly of Reserve Mining, in regular service around Escanaba, Michigan; other SD9s owned by the railroad are as of 2016[update] in a "deadline" in Wells, Michigan. Colorado & Southern 839, later Burlington Northern 6234, was donated by successor Burlington Northern Santa Fe Corp. to the Minnesota Transportation Museum. It now operates on the museum's Osceola and St Croix Valley Railway. 6234 is an example of the last variation of SD9 locomotives produced, which used the SD18 carbody. The Nevada Northern Railway uses #204, ex-SP SD9E #4426 to occasionally to pull their passenger trains. Southern Pacific 4404 is preserved at the Western Pacific Railroad Museum at Portola, California. It has been sold, and is now awaiting pickup in the Union Pacific Portola yard. Southern Pacific 4450 was scrapped in August 2013. Milwaukee Road 532, rebuilt by the Milwaukee into an 'SD10', lives at the Whitewater Valley Railroad. It was originally their 2235. Nickel Plate Road 349 is preserved at the Mad River & Nickel Plate Railroad Museum. It was retired as Norfolk Southern #52, and was donated to the museum in December 2010. It has been restored to its Norfolk & Western appearance. The Portland and Western Railroad uses two SD9s for switching and industry service. PNWR 1852 operates out of their Albany, OR Southern Pacific yard and PNWR 1854 is assigned to the rock train. The Western Rail Inc. owns 3 SD9m (SD9 rebuild) units. 13, 50, & 1886. 13 & 50 are Ex-Norfolk Southern, Exx-Norfolk & Western, née Nickel Plate Road. 1886 is Ex-Norfolk Southern, Exx-Southern, née Central of Georgia. BNSF still rosters several SD9's. 4 are known to have been rebuilt into SD9-3's, numbers 1550-1553, and have modern EMD cabs. An ex-Central of Georgia SD9, Black River & Western Railroad 9581, is currently on lease to Kinder-Morgan Newport News for yard duty. The Albany & Eastern Railroad Company (AERC) has 1 SD9E in Black Widow paint, AERC/LLW 5399, It is used for both Passenger and Freight service in Lebanon, OR. ^ Presented by Spencer Christian (2009). "Dakota Southern Railway". Tracks Ahead. Episode 707. Milwaukee, Wisconsin. PBS. WMVS/Milwaukee PBS. Archived from the original on 2008-11-21.